Growing up on a farm in Johnson County, Iowa, Dr. Bender learned the importance of family, community, hard work and nurturing livestock and farm pets. "I could not have had a better childhood to prepare me for a life of caring for animals and supporting people’s bonds with their pets,” says Dr. Bender. Dogs and cats, as well as their guardians, are sometimes anxious and nervous about visiting a veterinary clinic. 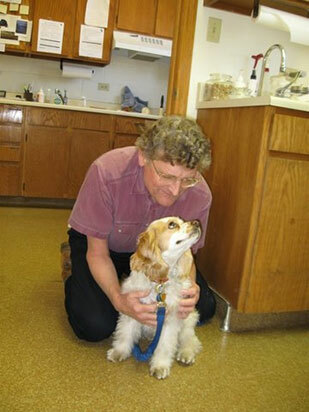 Many clients have commented that Dr. Bender’s quiet demeanor has soothed even the most fearful pet. He approaches each person and each pet with respect for their individual and unique character and needs. Dr. Bender has a special interest in veterinary diagnostics. The distilled wisdom of many years of practice enables him to offer clients valuable insights into their pet’s health or illness and to propose appropriate options for their medical care. Dr. Bender stays abreast of new developments in veterinary medicine by attending national veterinary seminars and conferences annually. 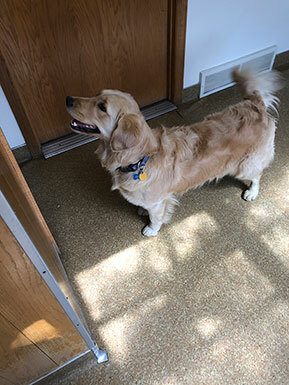 He consults with colleagues and specialists on difficult cases to bring clients the combined expertise needed to provide thoughtful and appropriate options for diagnosing and treating their pets’ illnesses. The veterinary assistants at the Louisville Veterinary Clinic share Dr. Bender’s commitment to providing clients and patients compassionate as well as competent veterinary care. They all have or have had beloved pets in their lives and are able to empathize with clients’ concerns. Every animal patient benefits from the deep and genuine love and respect for animals which is shared by every member of the staff. Dr. Bender is available to make house calls for clients who have difficulty getting their pets to the clinic. Clients have particularly appreciated Dr. Bender’s willingness to make house calls for humane euthanasia of their pets in the natural and familiar setting of their own home. Many years of practice have only deepened Dr. Bender’s dedication to the welfare of animals, and his commitment to the high ideals of the veterinary profession.